While all the AV/TI/INFOSEC firms have been masturbating to the latest outbreak of systems degrading malware, I have been sitting back after insuring that my environment has not been hit nor anyone connected to it. Since the reversal’s and the inevitable attribution fuckery cycle has spun up I have been pondering things outside the usual whodunnit. Lesley Carhart had a good post on why one should worry about such attacks and this kind of malware that people should read, I want to go a different route. What I want to talk about is motivation and with that motivation, yes, who is more likely to have carried out the attack. In this case we have yet another piece of malware that was either well coded or poorly coded depending on who you talk to. It was targeted or not targeted depending on who wants to sell you a service too. Well, I have nothing to sell you all, I just want to point out some interesting things regarding the whole mess. The one simple fact that the malware used a Ukrainian tax software (MEDoc) as the means of initial attack is telling. The time-line on this also pretty much shows (and I experienced this from messages to me the day of the incident) that Ukraine was patient zero. By looking at the image below from the linked page you can see that a great swath of Ukrainian infrastructure was hit on the 27th. 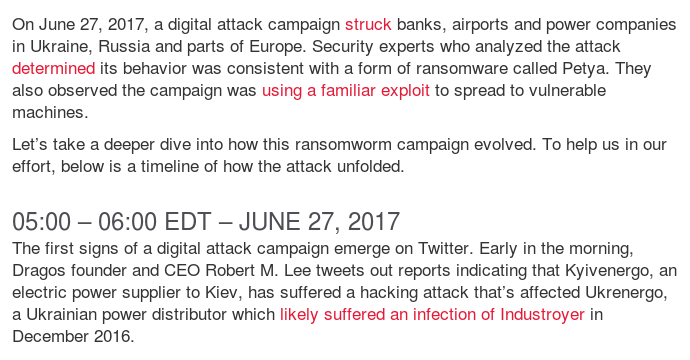 Coinciding with this malware attack later in the day several military and government individuals were assassinated in Ukraine as well. Are you starting to see a pattern here? Russia is carrying out an all out war against Ukraine and they are now using the means to an end of malware to deny, degrade, and deter the Ukrainian people and their government from being their own. The Russians get the advantage of using these techniques on Ukraine and no one is stopping them. They get the advantage of a smaller state infrastructure to attack which means more amplification of the effects on the populace as well. In larger states it is harder to carry these out and obviously would take much more effort. In fact, in the case of the Russian meddling in the US elections last year, one can see how much effort it took on the Russians part to carry out the attacks but as well, how a larger and diffused infrastructure gives varying levels of returns. Alas, for poor Ukraine you can see just how effective at degrading and perhaps disenfranchising the general populace can be with such attacks on their infrastructure. I heard one comment from a Ukrainian that just bespoke their resignation to the interruptions as they happen so much. All of this though, demoralizes the population and in the case of Ukraine, since the Maidan event, they have fought hard to stay free and that is why Russia is ramping up their attacks. So yeah, my money is on Russia and I will stick with Occam’s razor on that one. Now, on other thoughts about this malware and Wannacry I just have to once again muse about how we have now reached a place where malware is reaching parity with bio weapons. I say this in the sense that malware like Nyetya and Wannacry both had unintended consequences once released either willfully for by accident. They broke out of their cages, their battle-spaces, and began to infect the populace globally. Instead of having some poor shmuck getting on a plane and infecting the world, we now have malware that is either scanning the net for clients to attack or being sent out and then forwarded by accident (or on purpose) by actors. Could some of the infection vectors and trajectories be chaff to obscure the real targets? Sure, but I think in these last two cases the attackers perhaps did not take into account the interconnectedness of the world today. Anyway, those are my thoughts on the subject. 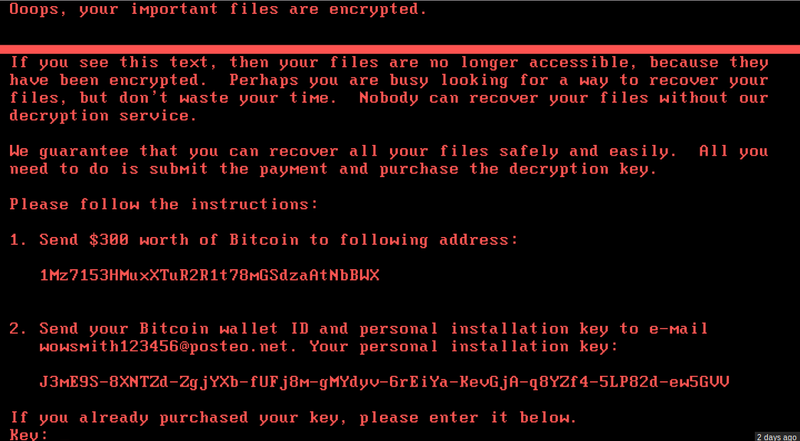 We are at a crossroads where malware like this can cause headaches but in the end, the world did not end did it? Your analysis always ends up somehow attributing everything to Russian government, which always irks me. Can a group of hackers, not affiliated with the government perform this level of attacks, and have access to the tools and the means to do so? If a particular event implies that Russia benefits from it, is not sufficient proof that Russia caused the event.